You only get one chance to make a first impression. Make sure it’s the right one, with business card printing from Shane Media. Our unbeatable range of substrates, including Soft Touch and Spot UV, offer a creative solution for every client. Plus, add 6mm rounded corners to ensure your Business Card stands out from the rest. Our 400gsm Premium Silk cards offer unrivalled value. For a sophisticated finish, try our 450gsm Matt Laminated cards. These cards are built to withstand the everyday wear-and-tear of life on the road. Its smooth finish brings out the lighter colours in the graphic, and allows for a softer image. Add a Spot UV coating to your 450gsm Matt Laminated cards for a targeted glossy finish. It creates a unique tactile and visual effect, which clearly sets it apart from all other cards on the market. Learn how to setup artwork for single-sided Spot UV cards with our Help Centre Spot UV help pages. Dazzle with our Gloss Laminated cards, with a reflective shine that brightens your graphics, and creates vibrant colours. On a super thick 450gsm card, it’s water-resistant, and has a strong tactile grip. Some things have to be felt to be believed. Our 450gsm Soft Touch cards have an astonishingly velvet finish. This card exudes class and sophistication, and is a must have for premium businesses. Need it fast? 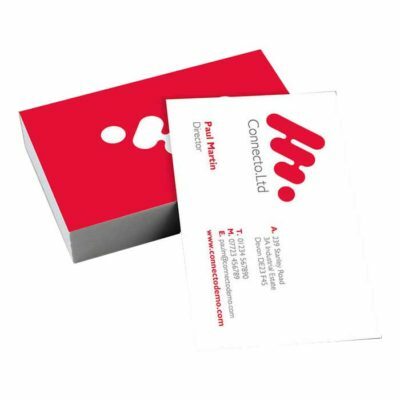 Same day business card printing is available on our 350gsm Silk and 400gsm Matt Laminated Business Cards! Simply select the Same Day option, visible on weekdays before 11am, and we will print your Business Cards that day and send on a next day courier service.